Another classic canoe stern Feadship comes on the market as Vesa Kaukonen and Mika Papunen at KK Superyachts in Monaco list the 26.45m motor yacht Sissi for sale. Built by Feadship in 1963, Sissi had a massive refit in 2010/2011 with a complete reconfiguration of her VIP suite, renewed galley and crew area, new generators, a hydraulic gangway, new air conditioning, a hull repaint and all new navigation electronics. 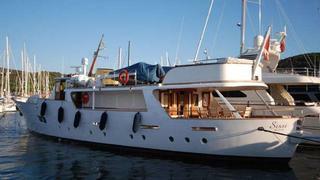 Accommodation is for eight guests in four staterooms. The master suite has a king size bed as does the new VIP stateroom while a double cabin has a queen size bed and there is also a twin cabin. All staterooms have full en suite facilities. Major features of this yacht include dining areas on the spacious fore deck and cockpit and her huge flybridge, making her ideal for entertaining. On the technical side, twin 550hp Detroit Diesel engines give her a cruising speed of 10 knots. Lying in Croatia, Sissi is asking €985,000.